I can't believe that we are already in July and I have not posted anything in over a month. Sorry about that peeps. 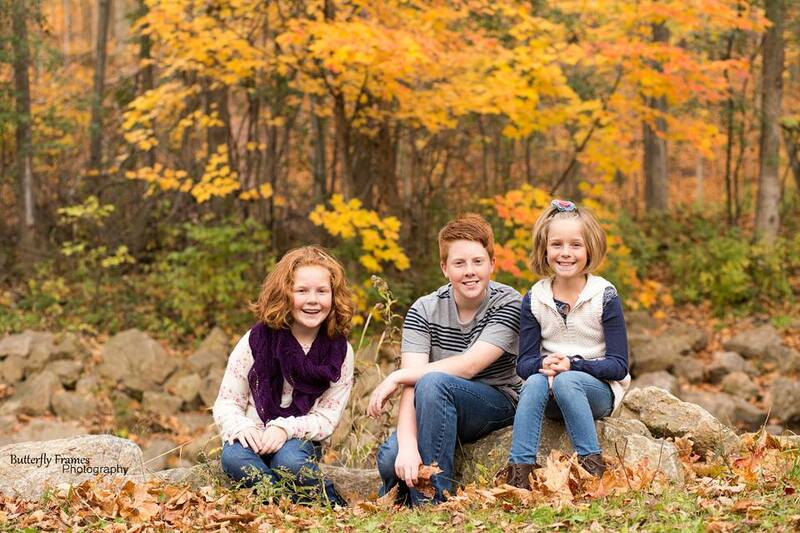 Seems like time is flying by or it has at least gotten away from me. I have been working with the kids on our annual butterfly project. Those of you that know me or my family well know the meaning behind butterflies for us. For those of you that don't here is a little insight. My sister, Meggan, always said she would be a butterfly. So, when she died we have all looked at butterflies as a symbol of Meggan. I find butterflies to be one of the most amazing creatures alive. The way they come alive is just incredible. And to watch this process thru the eyes of the kids makes it even more precious and dear to my heart. 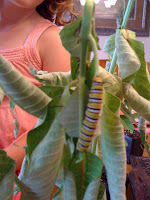 Normally we get painted lady caterpillars, but this year Jack asked if we could do monarchs. 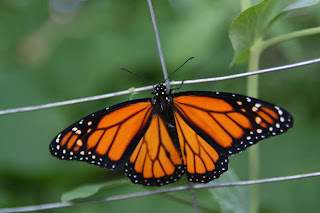 I did some research and found that Monarchs are close to being an endangered species. How sad I thought. Something so incredible looking and fragile! So, monarchs it was. 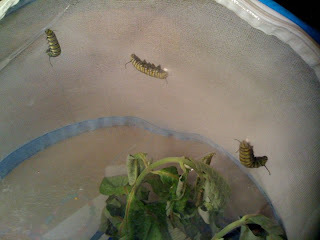 We received 9 or 10 caterpillars. Was hard to tell when they arrived because you are told not to touch them. That was one very specific thing. And oh they only eat Milkweed plants. The plant that I absolutely despised at our old house is what they feast on. It now makes sense why we had sooo many monarchs at our old house. So, we have spent the past few weeks yanking milkweed plants from ravines and forests in order to feed our caterpillars and watch them grow to over 2 inches long. And quite chubby at that! Finally the end of June they went in their Jade green Chrysalis. It was so beautiful looking! 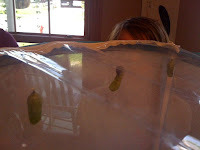 What was really neat is we got to actually see 2 of them go into the Chrysalis. Never have we gotten to see that before!! And today 14 days to the day we have butterflies. We are nursing a couple of them that seem to have some issues, but we have had 1 beautiful one (named Flyer by Jack) that we got to set free today. We hope that it will do well and not get eaten by anything! 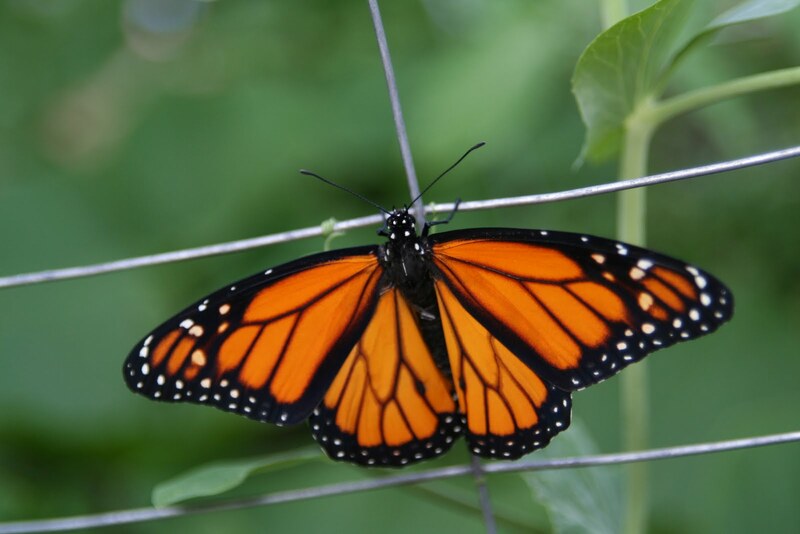 Another fun fact: Did you know that monarchs are actually poisonous? Yep, that is why they only eat Milkweed plants. There is something in those plants that they get their poisonous stuff (yeah real technical I know) from. :) How can such a beautiful thing be poisonous! !